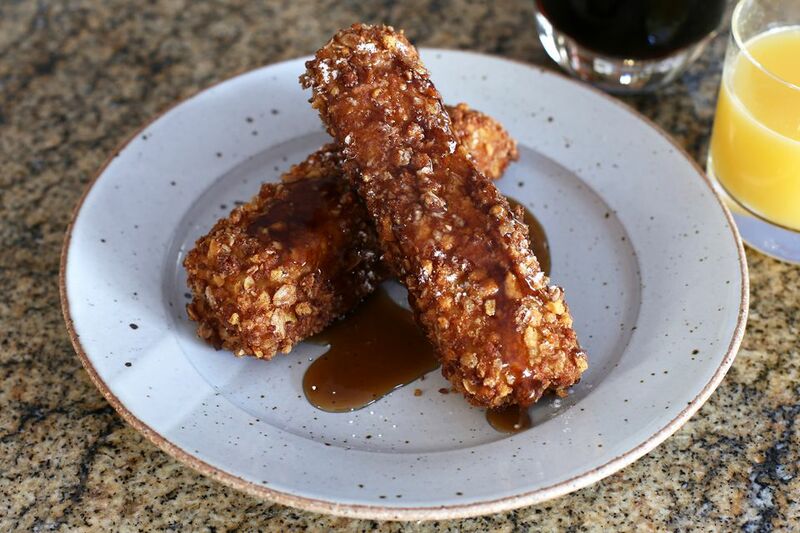 These granola coated French toast sticks are perfect for a special breakfast or brunch, and they can even serve as a dessert. The crunchy, flavorful granola coating takes them to another level, and they fry perfectly in only 90 seconds. The granola has plenty of natural sweetness, so there's really no need to add sugar to the egg mixture. I used Kashi Golean Cinnamon Crisp to coat the pictured French toast sticks and it was out of this world. Any flavor should work just fine. Use your favorite brand and flavor. Serve the French toast sticks with a dusting of powdered sugar and maple syrup. If you want to make a decadent breakfast, serve them with a dollop of whipped cream. As a dessert, serve them with a scoop of ice cream and caramel sauce or brown sugar pecan sauce. And don't feel that you have to make the French toast in stick shapes. Cut out thick shapes or slice the bread into cubes. Pour about 2 inches of vegetable oil in a deep heavy saucepan or Dutch oven. Attach a deep-fry thermometer to the pan and place it over medium-high heat. Heat to 370 F. Or heat the oil in an electric deep fryer to 370 F.
While the oil is heating, prepare the granola, bread, and egg batter. Put 4 cups of granola into a food processor. Pulse until most of the crumbs are fine — the granola should still have some texture. Pour the crumbs into a wide bowl. Slice the bread into sticks approximately 1-inch to 1 1/2-inches in width by about 4 inches in length, or as desired. In another bowl, whisk the eggs with the milk, salt, and vanilla extract. Roll the bread sticks in the egg to coat all sides thoroughly. Don't let them soak. Roll the egg batter-coated French toast sticks in the granola crumbs, patting as you roll it so all sides are thoroughly covered. Place them on a rack or on a plate while you coat more. Place two or three coated French toast sticks in the oil when it's at temperature. Time the French toast for about 40 seconds. Turn and continue cooking for another 40 to 45 seconds. Remove the French toast sticks with tongs and place them in the paper towel-lined baking pan to drain. If desired, keep them warm in a preheated 200 F oven while frying subsequent batches. Serve the French toast with fresh strawberries or blueberries or sliced fresh fruit. Sift powdered sugar over the French toast and drizzle with maple syrup, cane syrup, or a fruit or berry syrup. Or serve them with a small bowl of syrup on the side for dipping. Instead of sticks, cut the bread into cubes or thick shapes for the kids. Serve the warm French toast sticks as a dessert with a scoop of ice cream and caramel, butterscotch, or pecan dessert sauce.